In April 2010, our central air conditioner stopped working after a lightning storm and we chose the lowest Goodman GSX13 air conditioner system we could get! We were struggling at the time and really didn’t know how the heck we were going to be able to replace the central air conditioner, and the insurance company, while helpful, only wanted to swap parts… not the whole unit. After working with our insurance guy for a few days, we were able to get it done! This is our experience of replacing the Goodman GSX13 air conditioner. We live in Texas and have a single story home (ranch style). The old air conditioner was also a goodman air conditioner and was only about 7-8 years old. I won’t say we maintained it as well as we should have, but we did keep clean filters in place. We went through our insurance guy to find a contractor to look at the system (remember, we didn’t do much maintenance) and see if it could be repaired. After the second service guy told us it was useless to repair, we decided to pursue the replacement option. We have never been unhappy with the system, so we had both of the repair companies give us replacement estimates. After the first estimate, we actually told the second guy what we wanted quoted, and that we had another already. The only difference between the two quotes was the company! Since we were switching from R22 to R410 refrigerant, both recommended that we replace the copper tubing connecting the inside to the outside unit. Our inside propane furnace was fine and both said we could easily get many more years out of it. In the end, we actually chose the HIGHER of the two quotes for the Goodman air conditioner based on the relationship that was established with the salesman. He just seemed more like a service guy that knew what he was talking about. I also wanted to mention that I had considered buying one of these Goodman air conditioners online and installing it myself. I found some great deals on eBay, but by the time I added in shipping costs and then the learning curve of the installation, it really wasn’t worth the savings! If you would like to share information about your air conditioner prices, please use the share-a-price page, and let us know. 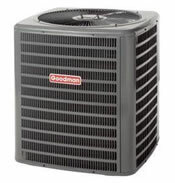 We try to publish one new hvac estimate, like this Goodman GSX13 air conditioner estimate, every day!